2010 was a year defined by Worldwake. Rarely before has a new Standard-legal expansion set shaped the Vintage metagame so shortly after its release. Read Stephen Menendian’s amazing new 2010 installment of the History of Vintage to learn about this transformation and much, much more. 2009 was the Year of the Monster. The governing theme of the year was the steady introduction of eye-catching oversized creatures making their way onto the battlefield via Tinker, Oath of Druids, and Dread Return. 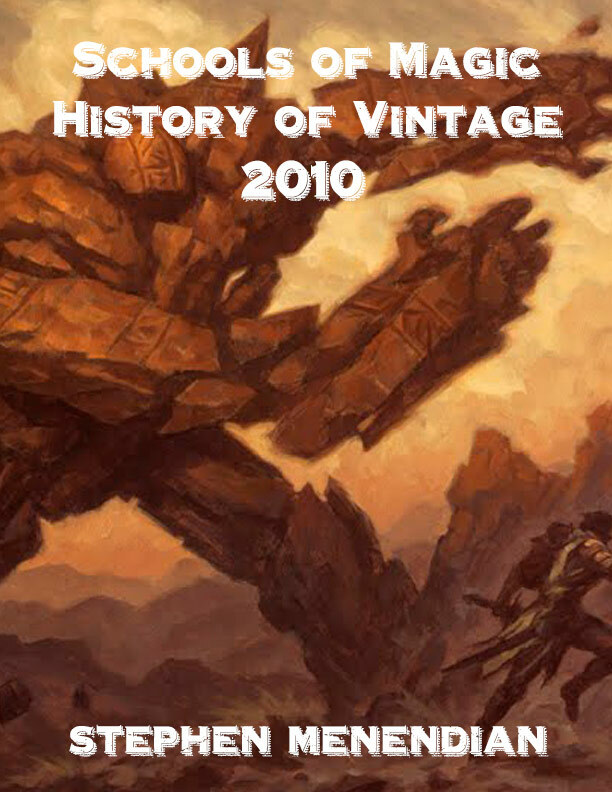 Exciting finishers like Iona, Inkwell Leviathan, and Hellkite Overlord brought a Timmy element to the landscape of competitive Vintage. At the same time, the restriction of Thirst for Knowledge helped rein in one of the format’s most oppressive archetypes and opened the door for a variety of draw engines to emerge as players embraced new ways to generate card advantage. Less conspicuously, 2009 was also the Year of the Utility Critter. Dark Confidant emerged – provisionally – as the draw engine of choice for blue decks, although alternatives proliferated. At the same time, new printings like Qasali Pridemage and Noble Hierarch boosted the fortunes of Fish and hatebears decks as they resurfaced to attack the Time Vault centered metagame. Seemingly innocuous threats like Fatestitcher and Bloodghast were new printings in a similar mold that found employ in the Dredge deck, boosting its fortunes far beyond their superficial power. As 2010 dawned a major restructuring of the format was imminent. Broadly speaking, the restriction of Thirst for Knowledge realigned the Vintage format, fostering a much more strategically diverse metagame by year’s end. Blue control, Dredge, Workshop, Fish, and Dark Ritual combo decks were all well represented among Vintage tournament Top 8s. The careful and prudently administered interventions of the DCI to promote strategic diversity would be overtaken by powerful new printings. Despite the classification as an “eternal” format, the only constant in the Vintage Magic is change. Every few years a set arrives that is disjunctive, separating ‘before’ from ‘after’ in the minds of players and the community. Some sets, such as Onslaught or Urza’s Saga, are paradigm shifts that fundamentally reshape the strategic possibilities in the format. Other sets like Future Sight are inflection points that reweave the relationships and fundamentally recalibrate the delicate dance between the great Schools of Vintage Magic. Such was the case with Worldwake. The 51st Magic expansion set, and first expansion in Zendikar block, Worldwake was released February 5th 2010. Deriving its name from a cycle of lands with çomes into play ‘common spell’ abilities, like Bojuka Bog, and a new cycle of creature-lands, Worldwake was, in theory, a land-themed set, much like its predecessor Zendikar. In practice, however, the spells would more fully define the contours of the format than nearly any set in recent years.